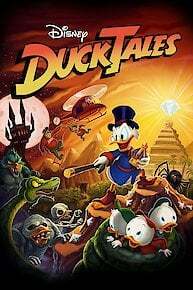 Duck Tales is an animated series centered around three young ducks, Huey, Duey, and Louie, as they live with their great uncle, Scrooge McDuck. The series is based on the Uncle Scrooge comic books by Carl Barks. The initial premise for the series stems from the boys being left by their uncle Donald Duck with his great uncle Scrooge when the former goes off to join the Navy. A typical story line involves the boys going off on a treasure hunt of some sort with any of the secondary characters, and realizing in the end that real treasure is not always gold, much to the chagrin of their miserly uncle. Uncle Scrooge is often plagued by villains and arch-enemies who try to steal his fortune, most importantly his "Number One Dime," the first thing he ever earned, which he keeps in a glass jar inside his vault. The main villains are Magica de Spell, the Beagle Boys, and Scrooge's most hate nemesis, Flintheart Glomgold. Although Scrooge is already wealthy, he is constantly trying to grow his wealth, all the while attempting to keep his title of "Richest Duck in the World" from being stolen by Flintheart. Secondary characters include the pilot, Launchpad McQuack, the butler, Duckworth, the inventor, Gyro Gearloose, and the nanny, Mrs. Beakley, as well as her granddaughter, Webby. Throughout the series more secondary characters were added, generally drawn from the "Duck Universe," such as Gladstone Gander, with extremely good luck, and the lovable but often bumbling, Bubba Duck. While much of the first season centered around world travelling and far-reaching adventures, the later episodes were based mainly in the town of Duckburg. While some of these characters were originally seen in the comic book, many of them were created exclusively for Duck Tales. Along with their globetrotting story lines, their were also many pop culture references, with stories that involved everyone from Sherlock Holmes to Shakespeare and everything in between. The show originally aired from September 18, 1987 through November 28, 1990, with a total of 100 episodes. It was the first Disney cartoon created for syndication. Scrooge, Launchpad, Dijon, and Poupon try to retrieve the Golden Goose from Glomgold and the Beagles before it can set off its transformations that can bring forth the end of the world. Dijon ends up joining the Brotherhood of the Goose, a group dedicated to protecting the Golden Goose (a goose that can turn anything to gold), led by his brother Poupon. Dijon "borrows" it, but accidentally loses it to Scrooge, who soon discovers its secret but then loses it to the Beagle Boys, whom Glomgold has sent to get it. When Scrooge loses his money due to a computer bug, he and Fenton travel through cyberspace to get it back. Fenton's mother accidentally shrinks the Gizmoduck suit, and the child-size suit ends up in the hands of Scrooge's nephews. Fenton uncovers an international conspiracy to steal Scrooge's gold overseas while supposedly on vacation. Scrooge meets up with Glittering Goldie again in order to acquire land filled with golden trees from her. However, Glomgold also wants that land. Scrooge acquires magical love arrows that once belonged to a goddess. Scrooge decides to become a vigilante after an unflattering report on him on television. Scrooge acquires a special glass from Gyro that makes the Money Bin invulnerable to attack. Ma Beagle pretends that she's married to Scrooge in order to inherit his fortune. The nephews makes business decisions in Scrooge's name while Scrooge is in the hospital. The Beagle Boys become the latest music sensation in Duckburg, much to Scrooge's chagrin. Scrooge suffers a case of amnesia, during which he protests against himself and dates Fenton's mother. Scrooge's nephews are trying to figure out just who Gizmoduck's secret identity is. So far, their predictions all point to Launchpad McQuack. Bubba's grades are deplorable, so the nephews use one of Gyro's latest inventions to increase his IQ, but they all soon become annoyed with the new Bubba. Inflation shoots up the roof when duplicating coins spread through Duckburg. A robot maid built by Gyro falls in love with GizmoDuck. Fenton's mother suffers a bad shock when trying to get better television reception. Her new-found psychic abilities are soon exploited by Scrooge, much to Fenton's chagrin. The Beagle Babes, female cousins of the Beagle Boys, kidnap Webby in ransom for a set of crown jewels. In this spoof of Romeo and Juliet, Bubba falls in love with the daughter of Scrooge's new neighbors, who have gotten in a feud with Scrooge. In order to receive their allowances ahead of time so they can buy a new scooter, the nephews trick Scrooge into believing it's Saturday instead of Friday, resulting in mass confusion worldwide. When Scrooge develops an unnatural ailment, Fenton takes him to a place where money isn't used. But Fenton's plan backfires when he gets the locals to use bottlecaps as currency. Lin-Manuel Miranda will give voice to Gizmoduck. It's actually amazing how perfectly this lines up. Get ready for an all-new version of Disney's classic cartoon series "DuckTales"
Ducktales is currently available to watch and stream on Walt Disney Television Animation. You can also buy, rent Ducktales on demand at Amazon, Sling, Google Play, iTunes online.